You know what I love about ADE? Everyone from the global music industry is in our town for a week. Over 2000 artists perform in Amsterdam in only five days. You’ll experience the best parties of the year in this lovely week in October because they all know they need to bring their A-game, since everyone’s watching. Apart from amazing parties and nights of dancing until your entire body hurts, ADE is full of inspiring workshops and panels as well, which is especially interesting for those who are interested in the industry behind it all or (want to) work in music. Out Electronic Recordings from Italy is hosting a seminar in the Tolhuistuin, where the relationship between sounds and emotions will be discussed. Does that sound interesting or what? The aim of this event is to explore the effect music can have on the mind and body through a reposition of relevant dance music artists and industry experts. The program exists of a seminar, panel and networking moment with music and drinks. 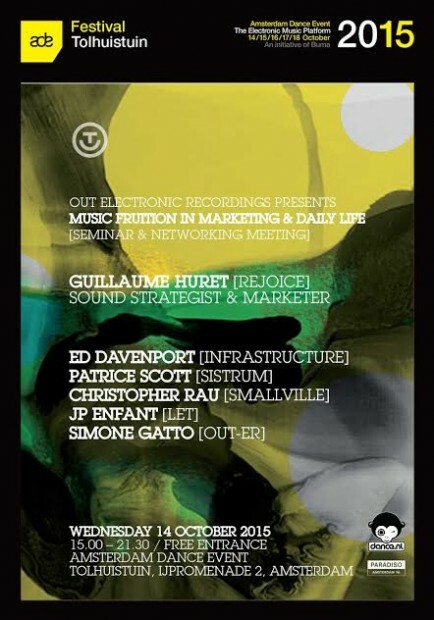 During the seminar Guillaume Huret and Simone Gatto will discuss philosophical, therapeutic and marketing case histories, researches and potential solutions about the connection between sounds and emotions. Guillaume Huret is a French sound strategist who has been working in sound branding and marketing for twenty years. He is an expert in linking complementary fields such as psychology, sociology, history, culture and neurosciences to music.